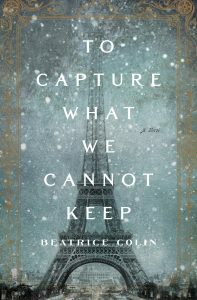 Beatrice Colin’s To Capture What We Cannot Keep, published in 2016, is set in 1887, when a young Scottish widow, Caitriona Wallace, finds herself chaperoning two siblings in Paris. A chance meeting with an engineer engaged in the construction of the Eiffel Tower, Émile Nouguier, leads to romance. The plot investigates the tensions between their social positions, their assigned gender roles, their affiliations to Scotland and France, and between duty and desire in the late Victorian period. I asked Beatrice some questions about the process of writing a ‘neo-Victorian’ Scottish novel. What drew you to set a novel in this particular period? To write about Paris in the 1880s was a real joy. I love the city and know it well – my great aunt lived near the Bois de Bolougne. Also, I am drawn to times of change – I’ve written about the birth of the German film industry and the early days of Jazz in America. The Eiffel Tower was at the forefront of a new style of engineering, one which used iron instead of stone, and this meant large structures could be built in novel ways. Eiffel was initially a bridge builder and most of the structures he supervised were fashioned in his workshops and then put together on site like huge Meccano sets. I set the novel in 1887-1889, the two years the tower took to build, in the hope of capturing something of those times. I found that although it was a time of innovation in engineering, art and music, for example, Paris at that time was quite rigidly conservative city. The class system was still very much in place and while the Neo-Impressionists were painting the island of Le Grande Jatte in dots, at the same time and in the same spot, men were engaged in the archaic ritual of duelling. Also, from a selfish point of view, I was tired of writing about war (I was and still am working on a novel about the Spanish Civil War) and wanted to write about something completely different. To Capture What You Cannot Keep is set primarily in late nineteenth-century Paris and Glasgow. Were you consciously thinking about the differences – and similarities – between these cities? How did you want to represent these? I was very conscious of the differences and similarities. Paris was, and is, a city where artists flock, to which people escape to paint or write and experience a certain kind of bohemian freedom. This idea of the city as the destination of choice for the artistic so they can starve in a garret has been portrayed in dozens of books and films from George Orwell’s Down and Out in Paris and London to Woody Allen’s Midnight in Paris. What I discovered when I started to research the novel was that my impression of both cities wasn’t quite accurate. Glasgow in the late 19th century was a manufacturing city where vast wealth was generated, fortunes could be amassed and where successful men from lowly backgrounds, such as William Arrol, could rise quite quickly up the social ladder. It was very provincial compared to Paris but there is evidence of traffic between the cities. James Duncan, who owned Benmore House on the Cowal Pennisular, was an art collector and sugar baron, who regularly visited Paris to buy paintings and had a large collection of work by French artists. Gustave Eiffel knew William Arrol and was at the opening of the Forth Rail Bridge. In my novel, I wanted to show both cities in ways that we haven’t seen before. In Paris, I wanted to show the contrast between the very rich to the very poor, as well as between the artistic and the less celebrated, but equally creative, engineers. I also wanted to re-imagine Glasgow in the same period and portray a city as a powerhouse of manufacturing. Following on from this, the novel sets up a strong contrast between the relative freedoms of France and the limitations of Cait’s life in Scotland. What impression did you want to convey of late Victorian Scotland? I think being a woman in this period was hard in any city. Any sense of freedom granted to women in Paris was illusory; women were either wives, mistresses or prostitutes. Having said that, there were some extremely wealthy prostitutes, known as ‘Le Grande Horizontals,’ such as Emilienne d’Alencon. Cait is only thirty but she is a widow. In that period women without an income of their own had to either marry again or live in genteel poverty. Although technology and culture were changing fast, the position of women was the same as it had been for hundreds of years. The difference in Paris was wealth; rich women had more freedom. How did you go about researching the historical background to the novel, and were any works particularly useful? I looked for books printed in the mid-20th century when 1880s were still in living memory, such as Elegant Wits and Grand Horizontals; Paris-La Belle Epoque by Cornelia Otis Skinner (Michael Joseph, 1963). I also consulted many books on Eiffel such as Gustave Eiffel by Henri Loyette (Rizolli, New York, 1985). I used a Baedecker from 1900 to make sure all the practical details were correct. Otherwise, I consulted photographs, paintings, costume archives and, of course, visited all the locations. Were you influenced by French and/or British writers from the late nineteenth century? I read some Zola when researching the novel. I also read Henry James, Edith Wharton (although she was American she lived in Paris). I read a lot of contemporary fiction, rather than Victorian. Indeed, I see my work as contemporary fiction written about a historical period rather than ‘historical fiction’ which is a genre which comes with its own conventions. Engineering is a central theme and provides a set of metaphors that run through To Capture What You Cannot Keep. What interested you about nineteenth-century engineering and engineers? Partly the way that iron had such a huge and lasting impact on construction but it’s an area that no one ever talks about. The Eiffel Tower is one of the most iconic structures in the world and yet few people know when it was built, by whom and why. Likewise, structures such as the Forth Rail Bridge, which was constructed by William Arrol’s company, is both beautifully light and aesthetically pleasing – it’s a joy to cross on the train! And yet although other figures of the 19th century – the artists, writers and composers – are celebrated, few people have heard of William Arrol or Emile Nouguier. Most people don’t realise the Eiffel Tower was named after a man. Do you consider To Capture What You Cannot Keep a part of a ‘neo-Victorian’ genre? I feel that there are some similarities between my work and the work of writers such as Sarah Waters and Andrew Miller in that we look at the 19th century through a 21st century lens. I am actively drawn to representing the era in a way that is true and shy away from ‘mis-remembering’ the period for the sake of the plot, or simply transposing a 21st century story into corsets and stays. It was such a fascinating era and there was so much that changed in a relatively short time. I discovered much more that I couldn’t fit into the book that I want to write about. Steam locomotives, for example. Interview by Kirstie Blair. Beatrice Colin is a Lecturer in Creative Writing at the University of Strathclyde.